“Talent wins games, but teamwork and intelligence wins championships”, said Michael Jordan. Organizations have traditionally used loyalty programmes and discount programmes to keep drawing customers back to them and generate repeat sales. More and more of them are discovering the potential of using this practice across various functions in the enterprise. Right from sales, customer service, HR to finance, IT and operations, one can tweak the work processes in such a way that there is competition among employees to outperform those ahead of them and earn not only recognition but also financial rewards. All of us have a streak of competitiveness in us; we want to win and go ahead of the others. Secondly, we fear missing opportunities and hence, do the best to capture as many of them as possible. Gamification leverages these two basic traits in us and sets us on the path of giving our best. This sounds logical, but most organizations and their executive leaders are prisoners of the status quo. The name, gamification is closer to fun and frolic than serious business. Hence, they curb their imagination and creativity from redesigning the work processes and introducing elements of gaming in there. 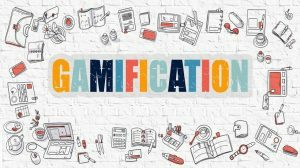 Gamification does not take the attention and focus away from work, rather it helps employees focus on the desired outcomes and hence, their commitment and loyalty. Does it suit every company? Each organization has its own context and its own beliefs. Some promote individual brilliance, while some insist on team work; some promote fun and informality at workplace while many others want discipline, rigour and regimental approach. They appear to be either-or situations where one has to either promote competitive spirit or team spirit, innovate processes or stick to proven methods. So, the question arises if gamification works irrespective of the organizational context. Leaders have to sort the priorities in their heads, first. Often, situations in real world are not either-or; they are simultaneous and driven on parallel tracks. Many leaders do not see this reality and hence, tend to derecognize the power of unleashing human potential by using gamification tools such as challenges, leader-boards and scorecards. Irrespective of a company’s context, one can find areas where one can gamify the work process. For example, it is prudent to not disturb the proven methods and practices in manufacturing while employees can be challenged to recommend changes to reduce waste, enhance productivity and deploy greater safety at work. We could run challenges to gather inputs, run experiments and show results. There could be points allocated to employees based on the impact of their recommendations, show a score-card of points earned by them throughout the challenge period, say 1 month. And involve the managers in the process to drive their teams to earn points and win as a team competing with the others to win the challenge. Great talent is not enough! Companies need to win the marathons. Each company is a powerhouse of talent in its own right and they have to make sure that the powerhouse works seamlessly so that the power supply is uninterrupted and conforms to the quality standard. It is like a symphony that needs each musician in the orchestra to perform flawlessly. Every organization has to ensure that all its talented players have to work in a team, raise the bar consistently and keep outperforming one another. At the same time, they have to make sure that they collaborate well, live for the long run and keep their focus on the long term vision. Organizations have to introduce changes from time to time, make course-corrections while driving towards the light at the end of the tunnel. It is not easy for people to adapt to the changes well. Gamification is a great way of driving change initiatives and changing old habits. Leaders have to develop the games, make the rules clear and keep them consistent over a long period of time. After all, they need to win championships!